Intöxicated is a new band from Germany who has released their debut via Hells Headbangers Records. And if older punk music and 80's sound of Motörhead is something that pleases the ears, it might be a good idea to check out Rock N Roll Hellpatrol. Not so much rock and roll in the songs, more simple and fast punk metal, but the charming thing is, that vocally and their attitude is in the same neighborhood as Lemmy from Motörhead. Don't care what others might think about them, they just do their stuff. Part of the songs are metal punk, but the better ones on the album is definitely Slutanic Speed Metal, where you get simple and fast metal that makes you smile. Break Your Limits is also a punk and metal song where they hit the right metal buttons. 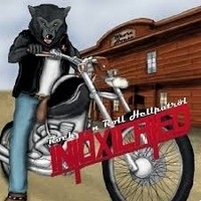 Rock N Roll Hellpatrol is the song that lies closest to the old Motörhead metal, not being any copy or likewise, just finding the style that Motörhead made some of their best songs from. Finally as the last song comes a little wonder. The Chase Is Better Than The Catch, slow and old school metal giving another example of the style that Intöxicated are playing in. More of that in the future, please.